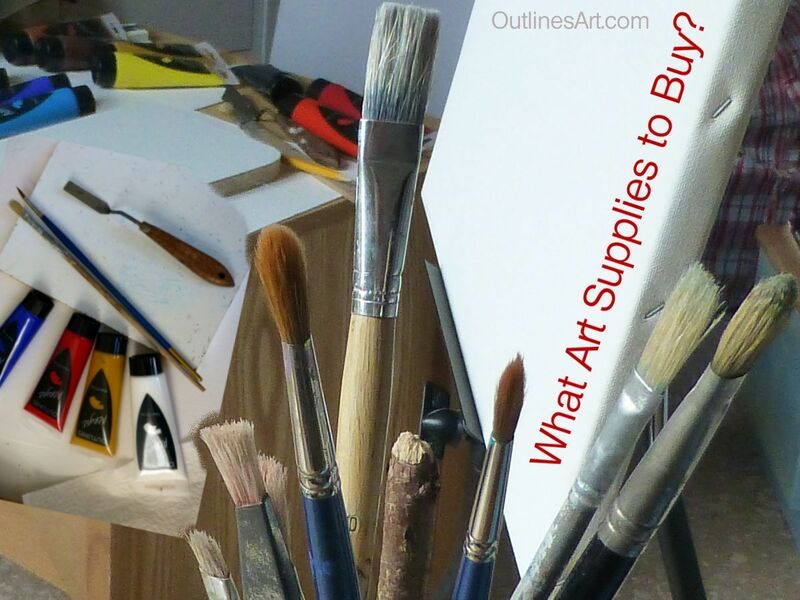 Are you dying to learn to paint but wondering what you need? There’s no need to worry, Absolute beginners Don’t need a lot to begin. 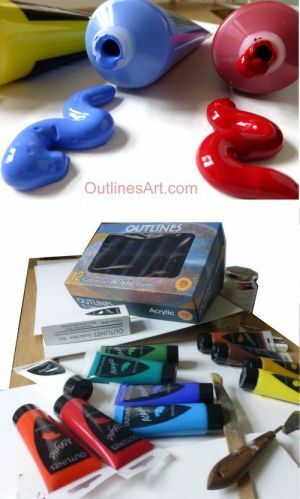 We’ll look at the bare essentials that will launch you on your journey as an artist and see how you can add to your art materials as you progress. It’s easy to find yourself putting things off because you don’t know what to buy first and don’t want to make a mistake or waste your hard-earned money. I’ve done it myself! I needed to make my bag super-light to go on a plane without hold luggage but I wanted to take some colour art materials with me. I thought of watercolour pencils, but had never used them before. I worried that I would choose the wrong colours and kept putting it off. In the end I simply bought a few, tried them out and added some more colours once I understood how they work and what could be done using them. The biggest mistake you can make is to hold back! And don’t be afraid to try things out – discover your preferences. The main thing is to get started and paint. Keep painting and you will learn and grow. No amount of reading and watching is a substitute for hands-on experience. By all means do that too, but if you take lessons in any form, be sure to follow along and DO what you see or read. While you’re at it, break the rules and experiment. Whatever mess you make is still a valuable learning experience. If the lack of a simple shopping list is preventing you from getting going with painting, read the notes below and refer to the checklist at the end. You will be able to follow my [link to the category] acrylic painting for beginners step by step instructions as soon as you have just a few art materials so do come back whenever you are ready to get started painting. Although we are focusing mainly on acrylics here, these colour recommendations apply equally to watercolours and oils. 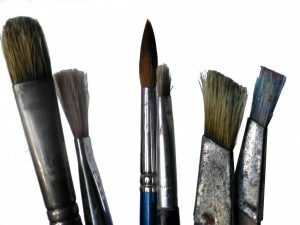 When using oil paints, you will need the appropriate thinners and painting meduims, rather than water. Now let’s see what you need. A basic set of colours that includes some earth colours, a white and a black will do very well. Many like to have one or two greens to avoid using up the pure colours too quickly (We write about Green in another article), or because they feel they need them. I like to have at least two shades of each of the primary colours; one warm and one cool each, of Red Blue and Yellow. The earth colours follow a similar pattern of warm and cool. Such a collection will enable you to mix almost any colour you want. It is with this in mind that the 12 colours for our set (Outlines) were chosen. But if you are really strapped for cash, just buy three colours and some white to get familiar with the medium (See ‘Resources’ below). You can add to your collection when you are ready and if you need a specific colour for a project, you can add those special colours one at a time. You need not worry about waste. 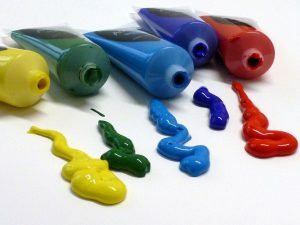 Different makes of acrylic paint as well as student and artist qualities, can be used together, and anything that needs ‘using up’ can be used for underpainting (a subject to be explained in another article). Student quality paints have less pigment than artist quality or have substitute pigments in them. 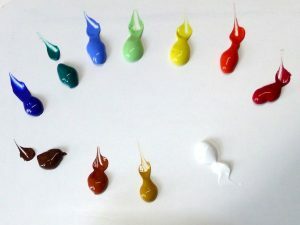 They are usually thinner or more fluid and may not cover as well as artist grade, but there are differences between pigment colours of the same quality and make too. The synthetic colours are generally very intense and cover well. If you are going to classes or intending to paint outdoors you will not go far wrong with Acrylic paints. One of the great advantages of using them is that they will be dry enough to transport easily very soon after your session, whereas oils would need some sort of separator to protect the wet surface. A rigger or liner is a long hair brush. These are essentially the same thing. The name depends on the supplier. Although you can improvise, you might enjoy using a bought artist’s pallette. There’s something satisfying about have one there, marking out your personal painting space, but really you can use almost any smooth surface that is plain in colour. White is helpful to see what the relationships are between the colours. You can get all different kinds of palletes and you might want to hold out until you know what types of paint you will be using and how your mixing habits develop. Acrylics will readily adhere to almost any surface, and you may well have something about the house you can paint on. If you’re itching to buy something, some ready-primed canvas-covered board would give you the texture of canvas on a stable flat surface without the complication of preparing a canvas. Ready stretched canvases like the ones in the photo are readily available from many big-name shops. This tool is – Optional. 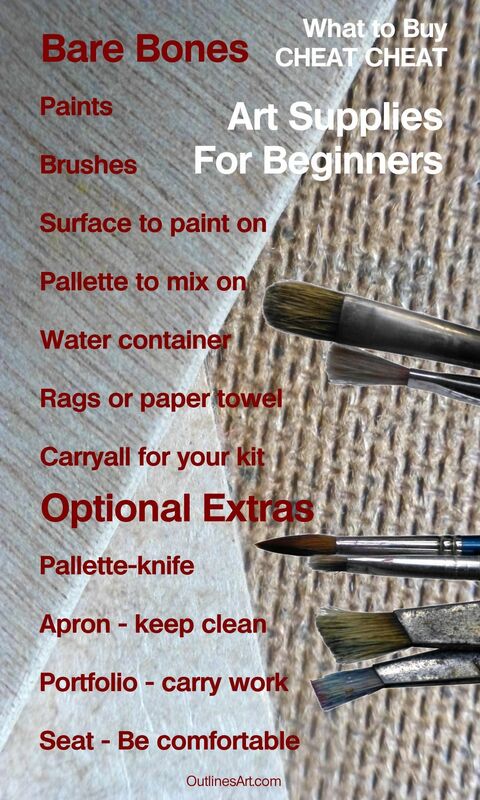 You don’t absolutely NEED a pallette knife to start painting but you may find owning one really useful, not only for mixing but for cleaning up after painting too. 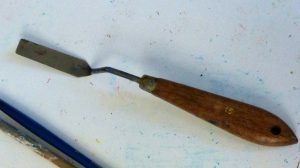 I like to have a pointy trowel shaped one and a square-ended one around. There are many shapes and sizes and they vary in thickness. you will develop your own preference, again, through experience. kitchen roll is fine. You will need something to soak up excess water or paint on brushes before rinsing them. I cut up old Tshirts – sometimes (I wear them to a thread). A bag or box for your stuff. Any strong bag, preferably one that closes or that stands without flopping. You don’t want the smaller items to fall out and get lost. Nor do you want your paints to get squashed. 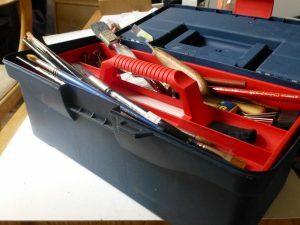 I use a plastic toolbox with a tray in the top. You can get one from your local DIY. The paints fit in the bottom and the top lid of this one has compartments that holds pencils, clips and other small items. The removable tray takes care of brushes and pallette knives. You might want to read more before deciding on an easel – there are so many different kinds! The same goes for portfolios and books. Easel: To hold your work – you can improvise while you make up your mind. Classes sometimes provide these. 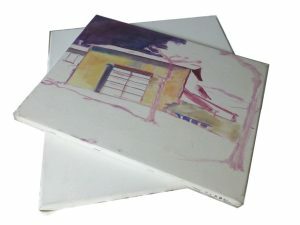 Portfolio: You will need something to carry your work if you paint outdoors or attend classes. Cotton rag: Yes you can buy rag! Pure cotton is environmentally friendly and is absorbent – I use old T shirts, but I never have enough. Surface protection: Wallpaper lining will give you an uncluttered work area and a roll will last quite a while, otherwise old newspapers will do the job. Clothes protection: You might want to wear an apron and sleeve guards as acrylic paints are difficult to remove from fabric. There are thousands of them. I’ll see if I can recommend a few. If you are near a library you could borrow before you buy. Containers for water & another for brushes – if using oil you will need something that will safely hold turpentine or brush cleaner. Light bulbs for an unlit area or night time. There are special bulbs for art that give a suitable spectrum of light. Seat – If working outdoors you might need a portable seat. Pallette: Anything smooth and flat will make a good pallette – in fact many artists prefer a sheet of thick glass with ground edges to a bought pallette. Alternatively, you can use a piece of Acrylic sheet, flat tile, piece of melamine shelving board. Some use a sheet of wood/plywood, flat shiny plastic, varnished wood or a piece of hardwood, old breadboard/cutting board. Painting surface: Canvas or fabric offcuts, board, plywood, metal sheets, and anything in the list for pallettes. Even cereal boxes are useful for trying out an idea. There is little that you can’t paint on, but something with texture may be easier to work with than a very shiny surface as the paint will adhere readily without sliding around. Paint: Sets of paint with very small tubes and a bigger range of colours can be a route to discovery. The colours might inspire, if they don’t overwhelm. If nothing else they can help you select the colours and Brands you will buy again, without spending a fortune. Paint Quality – Student ranges are fine from good brands. Some Cheaper Artist quality brands can be very good. Many use synthetic hues, which are cheaper to source than pure pigments and give excellent results. You can always move on to more expensive stuff as you gain confidence. I shall make a list with descriptions and comments later, of some of the paints I have used and liked. Sleeve Protectors: When I am wearing long sleeves and especially when wearing fluffy winter clothes I try to remember to put on some sleeve protectors. You can buy them ready made. I often use the bottom half of old leggings or old long socks with the feet cut off! Portfolio: You could carry your work between two sheets of hardboard or stiff cardboard hinged with gaffer tape (duct tape) at the bottom. Use a strong cord to tie it together and create a padded handle. Easel: Depending on the size and weight of your work, you might be able to set up a means of hanging it on the wall securely. Small items can be propped against a box that has some weight and an ‘L’ shaped batten can be used to prevent sliding. Feel free to download this image – right click and choose ‘save’ – It would be great if you would share it to you preferred social media account too! Thanks. If you enjoyed this post, why not Sign up now for more tips, delivered straight to your inbox. * Newsletters may include information on new products & the latest promotions.